With Springfield continuing to grow and a new master-planned community being developed at Ripley Valley, Ipswich will play an important role in the eventual recovery of Queensland’s building industry from its current weak condition. 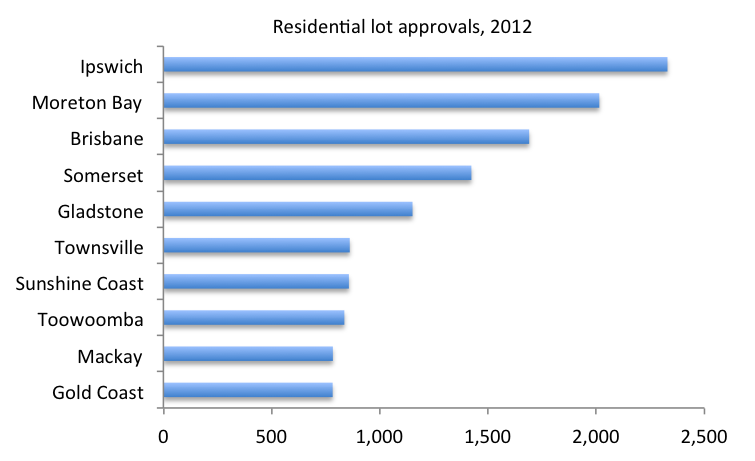 Indeed, residential land data published today by Queensland Treasury show the Ipswich local government area leads Queensland in residential lot approvals (first chart below), and that there was a surge in lot approvals in Ipswich in the December quarter of 2012 (second chart below). This entry was posted in Housing, Ipswich and tagged buidlingindustry, construction, housing, ipswich, land, lotapprovals, qld, qldtreasury, queensland, residentialland, treasury. Bookmark the permalink.